There were lots of prizes for Mercia paddlers at the Barrow race today. Best performance goes to Erin, in the small kayaks, a good effort. Adam is going faster and Andy kept Laurence quiet for over 20 minutes! Aaron came in second junior wwr. These are short timed races down a course which is set on a twisty loop of the River Soar. A cosy pub for a cup of tea and grub at the end, adds to the appeal. The full results are now available to download from the Avon Descent page. There are also a few pictures, and some video from Stratford weir. If anyone has their own pictures / videos / race reports they wish to share, please let the webmaster know via the contact page. The race was blessed by rain in the days beforehand and a frost and sun on the day. This meant it was good to paddle and good to watch. The river was running fast but not so high as to make Northenden Weir a portage, so we were expecting the 1 hour barrier to be broken. The weather attracted 32 paddlers for the race and 40 paddlers for the accompanying mini tour, from as far as Lincoln and Worcester. The latter is significant. The race had previously attracted local heroes, but this time a stranger rode into town. Well, not a stranger. 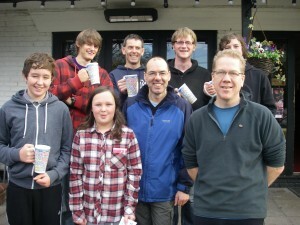 Stuart also came to Cheshire in midsummer and slashed the record for the solo Cheshire Ring Race. There were also records broken in the K1, WW Racer and Touring Canoe classes. We will be running the race and tour again in 13th October 2013, visit www.madcc.co.uk for details nearer the time. The 9.2 mile section of the river used for the race has one sloping weir and a dozen rubble weirs, this is part of the 18 mile Mersey Canoe Trail which is open every day. Details can be found in the web. Thanks to the competitors and everyone who helped. The hospitality of Burnage Rugby Club at the start and Trafford Metrovick Rugby Club at the end was very welcome. The detail results are as follows. The Mercia racing squad was reduced to four paddlers at the Burton event in June. The river Trent was high, with a strong flow and some well defined currents to read and use. This proved the undoing of many and fell into the hands of the more experienced. Aaron and Adam struggled to make headway upstream to the turn and keep up their speed, both slipping back from promising starts. Having spent many years training through the winter floods on the Thames and then the Avon at Bath, I relied on reading the water rather than pace. As a result I found myself in the lead off the start, something not experienced for a while, and later settled in for a third place. Subsequently after times were calculated, promotion followed to Div 4. I now have to follow in the wash of faster boats including Mike (not racing at Burton) and Laurence (paddling K2 with Ricky from Nottingham). Plans are also being made for a go at Sprint racing. The next Nottingham regatta in July is the target and 500/200m timed runs have been done on the canal. We have also resurrected the old race colours. As a concession to Laurence’s incessant badgering, I agreed to do the Leamington canoe race. There were a number of positive aspects informing my decision: it was local, it wasn’t a wash-ridden canal, and I didn’t have any mountain biking planned for Sunday. What nobody bothered to explain to me until I had already committed is that the four miles are punctuated by an infeasibly large number of turns. And my turns are best described as “leisurely”. Tricked again! My ancient asymmetrical paddles snapped the other evening during what I jokingly refer to as “training”. Many years of metal fatigue had finally taken their toll, and I was left clutching a very short single-bladed paddle in my left hand, and a quite long single-bladed paddle in my right hand. I managed to remain upright, but forward propulsion proved problematic. Having failed at the ‘J’ stroke, I settled on a technique that involved pushing myself along the canal bank with one hand, whilst using one of the blades with my other. This got me closer to the basin, until Adam returned in a Canadian to rescue me – once he’d stopped laughing. But I digress. The demise of my own paddles means I’ve been trying to get to grips with the wing paddles that nearly everybody who races has been using for years. They are definitely more efficient, but I can’t yet sprint as fast with them as with my old paddles, and they aren’t as good for turning or support strokes. And every now and then, they fight back and try to pull me in – probably when I extend the stroke a little too far back. So all in all, I decided that Leamington wasn’t the place to make my debut winged appearance, and chose instead an old pair of paddles that had been languishing in the club for years. Unlike previous races, where I set off slowly and got engulfed in wash, I decided to set off fast. Somewhat to my surprise, this meant I lead the race from the start until about half way, when the eventual winner overtook me at one of the numerous turns. I didn’t manage to negotiate any of the turns without resorting to a reverse sweep stroke, whereas she managed to get round fast using only forward strokes. And edging. I tried that on the next turn and only saved myself from falling in with a rapid and vigorous support stroke. With wing paddles I’d probably have swum. Div 9: David Darragh came first, and was promoted to Div 8. Quite a good points tally for the club. And what do points mean? More races, probably. D’oh! Having told everyone who would listen that I don’t do racing, it was with some surprise that I found myself driving towards Nuneaton with a couple of K1s on the roof of my car. The journey was enlivened by Adam demanding to know what I would do if various unlikely emergencies arose, such as the car in front exploding or a pylon falling on the road. Luckily none of these things happened, and the only incident of real interest was a sighting of Nuneaton’s magnificent Mount Jud, which Aaron later spotted again during the race (I was too focussed on my paddling to admire the scenery, naturally). In Div 9, David started to sink due to a hole in his boat and had to empty it, and barely made it afloat to the finish, where he arrived in 8th place, earning 16 points. In Div 8, Aaron put in a strong performance after a slightly fraught start (the wash was worse than at Gailey!). He was keeping pace with a group of 3 or 4 other paddlers, while I trailed miserably behind. He has obviously learned from his slow turn at Gailey, because this time he gained rather than lost a couple of places. I’m sure that the fact that one of the other paddlers was swimming to the bank and getting in the way of everyone by the time I arrived was simply an unfortunate coincidence and completely unrelated to one of the other paddlers later calling him a “tactical git” (I think we may have found his club nickname!). Aaron came 4th (our best result of the day), earning 18 points for the club, and missing out on promotion to Div 7 by only 13 seconds. As for me, I didn’t even get into a comfortable paddling rhythm until the return leg of the race, by which time it was too late to make up much distance – but I did spot an opportunity when I noticed that the paddler some way in front of me was nattering away to the crew in a C2, oblivious to the closing gap. I sneaked past on the opposite side of the C2 with perhaps 100 metres to go to the finish. At this point the C2 crew alerted her to my presence (spoilsports!) and she sprinted off in hot pursuit. Sadly, what would have been a magnificent place-gain for me was spoiled somewhat when I clipped a narrow boat with my paddle (or perhaps she hit me, or both) and fell in 50 metres or so from the finish. I got back in to complete the race in last-but-one place. Still earned 15 points for the club though! We watched Nigel (Div 5) and Adam (Div 6) start their races, and then returned to get out of the rain. As we walked back, the strains of the Oompa Loompa song played on cow bells could be heard emanating from some distant field. Nuneaton is a strange place. In his first Div 6 race, Adam had to paddle 8 miles and do an entirely pretend portage, during which he managed to invert his boat! He came in 8th, earning 13 points. In Div 5, Nigel came in 6th, earning 15 points. The full results are now available online. Having done a deal with Laurence to compete in one race in return for him writing some articles about his and Mike’s forthcoming Devizes to Westminster race, I found myself beside the canal at Gailey Canoe Club, along with Adam, Aaron, Mike (in a spectating capacity! ), Nigel W, Dave and Laurence, my hopes that the entire thing might have been an April Fool’s prank having been cruelly dashed. Naturally, I made sure all my excuses were deployed early: I don’t race, I’m not competitive, I haven’t done any training, and I’m still recovering from the lurgy. Still, we need the points apparently. And points mean prizes. Or something. (Actually, points mostly seem to mean the chance to compete in still more races, but then I never really got the hang of this stuff). As an odd numbered Div 9’er, I started my race alongside Aaron. For someone who used to complain about being bored well before bridge 2 on the Coventry Canal, his progress is remarkable. He caught up with me and moved into third place, and soon caught up and passed the girl in second place. I caught up with her too, but as I was attempting to pass, I had an unfortunate encounter with a paddler on the return leg and had to slow and veer away to try to avoid a collision (we got away with a glancing blow). That cost me some time. Unfortunately, Aaron lost his position in the turn (more competitive turning practice needed? ), and was unable to regain it. I caught up with him shortly before the end, and we were neck and neck, with Aaron just beating me to the finishing line to claim third place, a medal and a cream egg. Both our times were fast enough to earn promotion to Div 8. Dave came in 5th. Adam failed to pace himself properly and won his Div 8 race far too convincingly, earning promotion to Div 6! Now he has to do 8 mile races! Nigel W came 2nd in Div 5, and Laurence came 4th in Div 4. The full race results are on Gailey Canoe Club’s website. A good turn out in the cold but sunny weather for the Barrow event.